In my previous article, “Global warming I: Is it true or is it a hoax?“, I wrote about the factors that may be causing the increase in average temperatures on the planet and therefore a likely cause for the climate changes we have seen . In this article I will discuss some evidences of warming, causes and possible consequences. The polar ice caps are regions of high latitude covered by ice, which exist on our planet and in others, such as Mars. On our planet, we have these regions in the Arctic (North Pole) and in the Antarctic (South Pole). Besides the large amounts of glaciers and sea ice, there is also the permafrost, specially in the Arctic, and which consists of constantly frozen layers of earth, rock and ice. We saw in the previous article that the levels of CO2 have grown rapidly these last decades, and has even surpassed high scores of the last 650,000 years! One concern is the fact that much of the concentration of greenhouse gases, in particular CO2, lies precisely in the Arctic. We can thus conclude that the greenhouse effect will be more intense in this area of the globe. One of the direct consequences of these temperature rises is to be causing the thawing of the polar ice caps, especially in the Arctic. The retreat of the ice cap is of concern and has increased dramatically in recent decades. It is believed that the retreat has slowly begun since 1850. However, in recent decades this decline has been increasing faster, which has left many scientists to be concerned. Some claim the melted ice area is about twice the size of Texas, in the last 20 years. In Antarctica, although such a sharp decline is not being verified, it has also witnessed alarming losses of ice. And this is not happening just at the poles! In mountainous places, of very high altitude, there are also some glaciers and ice caps disappearing. An example is the region of Patagonia in South America, in the south of the mountain range of the Andes. In the higher areas there are glaciers that are also decreasing in size. Lakes that were once ice, are now in liquid state. Is not sure whether this rate will increase in the coming years. If the permafrost itselfs begins to melt, the consequences will be catastrophic. There are worrying projections for the coming decades, but I will address them in the third and final article on this topic. For now, lets talk about the current effects. Although we may think that we are talking about mere millimetres, but the truth is that this increase has already caused problems in some locations. One of the most dramatic cases is happening in Tuvalu, a state of Polynesia formed by a group of nine atolls. The highest point of Tuvalu is only 4.6m. The Australian government, in a report on climate change in the Pacific, concluded that sea levels in Tuvalu area, measured by satellites, has risen about 5 mm per year since 1993. In recent years, there have been an increase of severe floods, reaching places where the sea has already entered in some houses. If sea levels continue to rise in this area of the Pacific, Tuvalu is doomed to disappear. But there are more islands are at risk! Even this year of 2014, there were abnormal sea conditions in various countries of Europe, including Portugal, Spain, France and England. In Portugal there were numerous cases of localities affected by huge waves, above average, which caused enormous damage from Costa da Caparica to the municipalities of Espinho and Ovar, where the sea has even invaded some streets near the coast. In Spain, in Galicia, giant waves destroyed many infrastructures by seaside and caused victims who were swept away by the waves. In France, giant waves struck the area of Senes, where residents reported having never seen anything like this before, and in other locations. The English coast also suffered significant damage. Can these scenarios repeat themselves with more serious consequences? The oceans absorb CO2 that exists in the atmosphere. With the increased concentration of this gas into the atmosphere, oceans have come to increasingly absorb more carbon dioxide. It is estimated that 30-40% of the CO2 emitted by humans is being absorbed by the sea. Some may think that this effect is positive, relieving the concentration of CO2 in the atmosphere, but the truth is that this causes a series of chemical reactions in the sea, such as the increase of the concentration of hydrogen ions (H+) and the decrease pH, that is, increasing the acidification of the water. Studies show that before the industrial era (eighteenth century) the pH of the ocean surface would be around 8,179. In the 90s the value will have fallen to 8,104 and at present days this value is around 8,069, which indicates a fast pace in the acidification of the sea. This effect may even benefit some species, such as sea stars, but many other species will be in danger! The first impact will be on the organisms that rely on calcium carbonate, such as corals, clams with shell, crustaceans, and others that are at the base of the food chain for many other marine animals, since the acidification of the sea will cause a dissolution of this compound. As a result, we may experience a reduction of marine species consumed by humans. 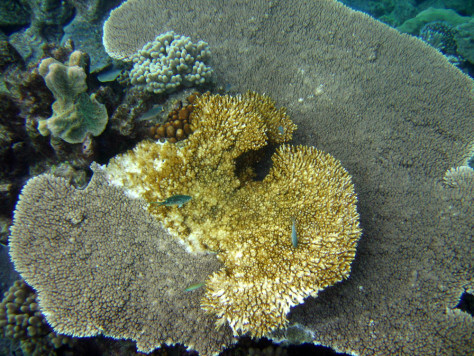 A study shows that even coral reefs are dying faster than expected in the Pacific! All these variables, as we have seen, are already affecting our planet. At present, there are already happening extreme weather events such as storms, floods, droughts and heat waves, which have contributed to an increase in forest fires. There are those who criticise and oppose to this subject. Read more about the controversies and opposers of global warming in my next article: Global warming III: The opposers and the controversies.